OSHAWA, Ont. – The North Bay Battalion was invited to the Oshawa Generals’ banner night Sunday. Coach Stan Butler kept the Troops in the dressing room for the festivities but, once they emerged, Joe Manchurek scored three goals and goaltender Jeremy Brodeur made 30 saves for his second shutout of the season as the Generals blanked the Battalion 5-0. 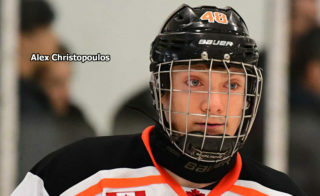 Kenny Huether had one goal and one assist and Stephen Desrocher also scored for Oshawa, which got two assists from each of Matt Mistele, Jacob Graves and Jack Studnicka before 5,955 at the General Motors Centre. 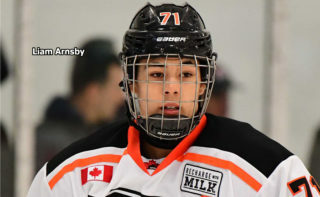 Oshawa, which defeated North Bay in six games in the Ontario Hockey League’s Eastern Conference Championship Series last spring before capturing the Memorial Cup, opened the season by splitting a pair of road dates. Brodeur made 23 stops in a 3-0 win over the Guelph Storm on Friday night. Goaltender Jake Smith faced 35 shots for the Battalion, which opened its campaign Friday night with a 4-1 home-ice loss to the Peterborough Petes. Fired up after a lengthy ceremony commemorating their championship season, the Generals opened the scoring 31 seconds into the game when Manchurek found himself alone with a loose puck in front of Smith and slipped it under the goaltender. Manchurek struck again at 6:26, converting the rebound of Misha Moor’s left-point shot from the left lip of the crease. Oshawa outshot the Troops 16-10 in the period. Brodeur denied Zach Poirier as he rushed across the goalmouth in the fourth minute and grabbed the puck off the goal line after Brett McKenzie slipped the disc between the goaltender’s pads in the 10th. Brodeur got his right pad on a Miles Liberati drive from the slot in the 14th minute and saw Poirier’s tip of a Zach Shankar shot hit the crossbar in the last minute. Smith was called on to make big saves on Lukas Lofquist, who broke in alone in the third minute, Huether in the fifth and Desrocher in the 10th. Smith faced a barrage of shots from Lofquist and Mistele in the 12th minute. Defenceman Desrocher made it 3-0 on the power play at 9:21 of the second period when his low blast from the blue line eluded a screened Smith. North Bay held a 14-7 edge in shots and had Brodeur under siege for the first half of the frame. The goaltender made two stops on Poirier and Mark Shoemaker and turned away chances by Max Kislinger, Zach Bratina and Mike Amadio. Smith was sharp on two shots from Mistele and also denied Lofquist, Huether and Domenic Commisso. Studnicka stripped Kislinger of the puck and sent Huether in alone to beat Smith to the stick side at 2:25 of the third period, and Manchurek completed the scoring at 9:54, swatting his own rebound over the crouching Smith. The Troops had six shots in the third period, with Brodeur turning away Amadio’s effort at a Liberati rebound in the second minute, sprawling to get his left pad on a Cam Dineen deke attempt in the eighth and denying Poirier in close in the 14th. 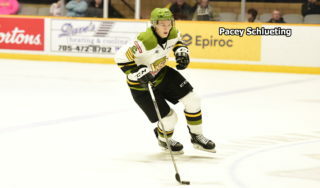 The Battalion hosts the Kitchener Rangers at 7 p.m. Thursday. 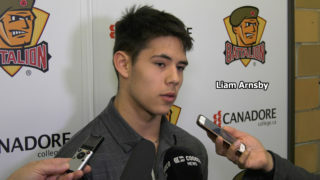 BATTALION BULLETS: The Generals raised four banners, for East Division, Eastern Conference, OHL and Memorial Cup titles. D.J. 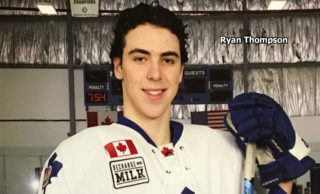 Smith, head coach last season, delivered the Memorial Cup to centre ice to thunderous applause … The last hitch in the script had the public address announcer call Roland McKeown to the faceoff as Battalion captain rather than Amadio. McKeown is a member of the Kingston Frontenacs … North Bay went 0-for-2 on the power play. Oshawa was 1-for-5 … Liberati led the Troops with six shots on goal, while Poirier was credited with five … Opening line combinations featured Amadio centring left winger Bratina and Poirier on right wing, McKenzie centring left winger Mike Baird and right winger Mathew Santos and Kyle Potts pivoting left winger Owen Green and David Sherman on right wing. Kislinger centred left winger Jacob Ball and right winger Justin Brazeau … The Battalion scratched Austin Kosack, Kyle Wood, Brady Lyle, Kyle Moore and Calvin Gomes … Santos was spared supplementary discipline for a head-checking major assessed for a shoulder hit on Peterborough’s Josh Maguire … Oshawa dressed 17 skaters, one below the limit … Bob Jones, the Generals’ head coach, is a onetime Battalion assistant in Brampton. 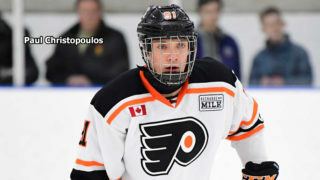 Smith now is with the National Hockey League’s Toronto Maple Leafs.